HYATT house offers the flexibility and essential services of a typical hotel but the space, comfort and conveniences of a fully furnished apartment. Spacious design & layout gives the property a residential appearance and appeal. Each suite features a comfortable living area with sectional sofa, the luxurious HYATT Grand bedding package, spacious bath with glass shower, and a fully equipped kitchen. Complimentary services include transportation to area businesses & attractions, a full breakfast buffet including Seattles Best coffee & a made-to-order omelet station, wireless Internet, local calls, complete business center, & self-parking. The new H-Bar is located in the lobby and is serving drinks, appetizers, & light dinner options nightly from 5pm till 10pm. Pets are welcome for just $75 ($175 for stays longer than 7 nights; Service animals are exempt from fees). Special Cancel Policy in effect for 03FEB17-05FEB17. All reservations will be full prepayment non refundable during this time. 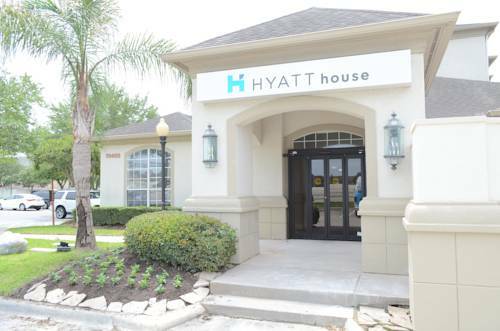 Centrally located in the heart of Houstons Energy Corridor District, the HYATT House is just minutes from some of the largest energy companies in the world, as well as countless other Fortune 500 corporations. Must Guarantee to Credit Card at booking. 24 Hour Cancellation - Must cancel by 3pm Hotel Time 24 Hours Prior to Arrival Special Cancel Policy in effect for 03FEB17-05FEB17. All reservations will be full prepayment non refundable during this time.